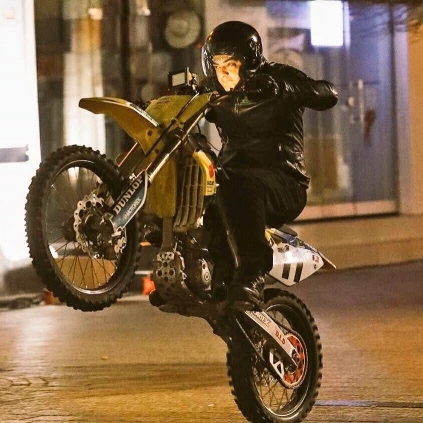 THALA AJITH’S STUNT BIKE VIDEO GOES VIRAL! Director Siva gave a pleasant Sunday morning surprise to all Ajith fans by posting a new bike stunt photo of Thala in his Twitter space. Then a video of Thala Ajith doing a breathtaking bike stunt was leaked online. The video and the photo immediately got trending virally in all the social networking spaces. This is a treat for Ajith fans who are waiting to catch a glimpse of their favorite star for quite some time now. It was a very short video where Ajith had done a bike wheeling with ease and élan. For a star of his stature, he could have easily used a stunt double but he did not. You could also see him blushing in joy after completing the stunt which clearly indicates that he loved what he did and he looked very satisfied with the ride. Such daredevil stunts are not new for Thala. He constantly keeps pushing the bar higher and clearly loves to do them. We also wish that he keeps himself from harm’s way. Breaking: Heroine finalized for Mannavan Vanthanadi! After VIP 2, Maari 2 gets ready! A New Born Affinity Towards Ajith Kumar!